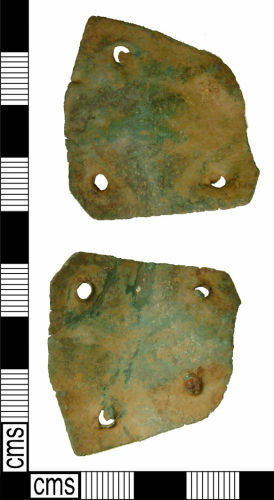 Medieval copper alloy roughly square-shaped piece of sheet metal, with a rivet hole c.2.5mm in diameter at each corner. The object measures 36.4x38.4x0.6mm and weighs 4.17g. Two of the corners have been cut across diagonally. Another corner is curved. The object is slightly bent. One rivet appears intact in one rivet hole, apparently made of iron. Possible a vessel or other repair.